You are currently browsing the category archive for the ‘Holiday traditions’ category. It’s that time of year where everyone wants to know what’s in everyone else’s Easter basket. Moms wonder if they are giving enough, or too much, and what items are age appropriate. Some families celebrate with big gifts and some celebrate with just a few chocolate eggs. However you decide to celebrate is totally up to you! When I was a little kid, my three siblings and I each received our own baskets. They were usually stocked with the same candies year after year. But that’s OK because we knew what to look forward to every year. We could count on each of us getting our own coveted Cadbury egg. By the time we were teenagers my mom focused on one family basket instead of four individual baskets. I think it was easier for her, but I also think she just wanted in on the candy haul without having to bargain with each of us for it. She filled one giant basket with all our favorite candies and no gifts. She also added in real eggs that had been dyed, and individual loaves of Italian Easter bread made from scratch. If you have not had Italian Easter bread Google it now and get to baking! Or find a bakery near you that makes them! So delicious! For my kids, we have done something different every year. We usually include “gifts” in their baskets simply because kids never stop needing things. We use this as a great excuse to include whatever items they need at the moment, like a new pair of spring pajamas, swim gear, art supplies and rain gear. The kids think it’s the most amazing thing ever that the Easter Bunny knew they were running out of underwear. I didn’t say these were all extravagant gifts, but gifts none-the-less. This year they have all the swim suits and underwear they need. So what’s next? Well, this Easter season has us smack dab in the middle of a new lifestyle challenge in our house. We are working hard to eliminate as much unnecessary plastic and packaging as we can. And let’s face it, every holiday comes prepackaged these days. I had to really think about this to find something new the girls will find exciting! Rain boots- my kids are coincidentally in need of new rubber rain boots. These are something we need as we simply cannot pass up a good puddle to jump around in. Chocolates- I know real original. But, we buy from a local store where we can get individual favorites packaged together in a recyclable paper box, and chocolate bunnies in a paper bag. Due to food allergies we can’t have Cadbury eggs in our house. But that means we get spoiled with some really good chocolate! Gift Cards- This is my new favorite item to give for every holiday! So much less packaging and nothing left to clutter up my house! It’s also like prepaying for our fun! We are adding gift cards to the local ice cream shop, Target, museum passes, even our favorite salon. Yes, I said salon. Kids need hair cuts and it’s like a fun day out for us girls! T-shirts- not just any t-shirts! We bought the T-shirts from their favorite bounce place which will give us $4 off every return trip. You bundle that with a gift card to the ice cream shop and you have a really fun day out! Summer shoes- They have also outgrown their summer shoes. Even though it is practical and it’s something I would have bought them anyway, I am turning it into a gifting opportunity. Also, I got them on a really great clearance sale last year. Ha! Now I know, most people eschew actual gift giving at Easter. However, I’ve never been one to really care what other people do with their money or holidays. I just try to stay in my own lane. So, whether throwing some candy in a basket and leaving on the kitchen table is more your thing, or hand stitching bunny costumes for every member of your family, no one here will be judging. Or nosing around your basket sneaking Cadbury eggs. The Whatever Mom is a full-time wife and twin mama living on coffee and wine. She enjoys the pure rush of cleaning the BIG potty between loads of laundry. It is her dream that moms everywhere accept and embrace the Whatever Mom philosophy which can be found here. You can also find her musings and popular shares on Facebook and Twitter. Stay up to date with her creative ideas and outings on Pinterest. The Internet is abuzz with different challenges you can do with your family during the 40 Days of Lent. There is the de-cluttering challenge to eliminate 40 bags of stuff in 40 days. The 40 Acts challenge to do 40 random acts of kindness in 40 days. And the challenge to just give up something you love for 40 days straight- whether it is chocolate, or wine, or even social media. The point is people are preparing to give up something for 40 days as a way to honor their traditions. But what if you do not celebrate Lent? How can you participate in the giving part without participating in the religious aspect? Well, all it takes is 40 days and a plan! I am introducing 40 Days of Change in our house this week. We are literally using our spare change to help make a change. My kids get paid a quarter for certain chores each day and we will let them decide how much of their earnings they would like to contribute to our cause. Start by selecting a clean jar, or box to collect your spare change in. Keep it in a location you pass every day when you come home. You simply empty your pocket change (or change from the bottom of your purse, or the few coins in your wallet) into this container. Random single dollar bills count too, and so does the quarter in the couch or the pile of pennies in your car console. Next, open your calendar. Mark the day you start collecting your spare change and count out 40 days. That will be your official end date. Take whatever you collect in that 40 day time period to your bank or local Coin Star machine. Once you have counted and cashed in all your loose change you are ready to make your donation. It doesn’t matter how big, or small your contribution is. Every single penny counts! The SPCA (You can search for your local shelter, or for local animal rescues). You can get a little creative and use the money you collect to pay off lunches at your kid’s school, or prepay someone’s coffee at your local coffee house. Perhaps you prefer purchasing gift cards from a local grocery store and handing them out to families standing in line at check out. Earlier this year my girls and I were on the receiving end of a random act of kindness. A lovely woman realized she had a handful of gift cards for the movie concession stand she wasn’t going to use. So, she stood by the ticket booth and handed them out to families that were on their way in. She selected us and it was truly touching to be on the receiving end of such generosity. It also allowed me to splurge on treats for my kids. There are no rules to 40 Days of Change. We can pick a charity every 40 days if we like, or just stick to doing it once a year. I hope my family will enjoy a new 40 day challenge at least three times a year. Even if we only raise a few dollars each time, the value lies in giving back routinely. Helping my kids connect the entire process of planning, and saving to giveaway, will help them recognize a need and find a way to fill it. They can see that every action matters and through action we can make a difference in our own community. Hannah and Jayden playing at the playground in Central Park in New York City. First, let me start by saying that New Yorkers in general get a bad rap. It’s not that we’re rude; we’re just busy and the city is the prime example. I think the term “hustle and bustle” must have been coined by someone living in NYC. I’ve never seen little old ladies with walkers move faster than me before. We met some pretty nice people too. Not one, but two people offered up their seats on a crowded subway for me and my toddler who was cranky from being confined to her stroller most of the day. One lady overheard my remark about “looking like we just walked in a big circle” and immediately offered to give us directions. It was super crowded the day before New Year’s Eve. At one point while walking past some of the amazing light displays my family was caught in a human traffic jam. I had to do breathing exercises to keep from panicking at all the people who were in my personal space. Then someone in a Mickey Mouse costume appeared in the crowd and I had to laugh, because this type of thing never happens in the Hudson Valley. Our trips to NYC are always full of surprises and it is fun because you never know what will happen next, but here are five times I was reminded just how glad I am to be living in the Hudson Valley. 1. The Food Prices – Okay so we were in Manhattan and I get that it’s going to be expensive, but I almost choked when the lunch we got at a hot dog cart by Bryant Park almost required that we take out a second mortgage. I’m exaggerating, but not by much. Four hotdogs and what passes for chicken on a stick for $27, without drinks, was so crazy I almost left running for Grand Central. The most expensive hot chocolate I’ve ever had at $4.50 a cup. Other highlights include the $4.50 a piece cups of hot cocoa that left a lot of chocolate to be desired. We did luck out for dinner and found a $1 a slice pizza joint, which almost made up for our pricey lunch. But my aching feet would have killed for just a place to sit down and eat. Not only is NYC the city that never sleeps, it’s also the city that never sits. 2. The Fresh Air – There were quite a few moments I had to literally hold my breath. I’m not sure if it was sewer, garbage or just the sheer volume of people, but I was gasping for fresh air. It was definitely a little shocking to this country girl. Unless you’re driving past a farm, you never have to think twice about breathing deep the fresh sweet air in the Hudson Valley. 3. Space – The buildings in Manhattan are positively breathtaking. They are works of art just sitting there disguised at normal buildings. Even without the beautiful light displays, I could spend an entire day just staring at these amazing feats of architecture. That being said, it was an adjustment for this country girl to get used to not having space. Space is something we have in spades in the Hudson Valley. We have our own yards and we always have plenty of space to pass someone on the street without feeling like a piece of cattle being herded through a stockyard. 4. The Heartbreaking Homeless Population – I’m sure it’s different in the boroughs, but in Manhattan we were surrounded by either the rich or the homeless. I saw people literally freezing in the name of fashion wearing little more than thin leggings and fur coats or vests or people freezing because they were living on the streets. One lady had a baby with her and was asking for diapers so we took out all but one of Sydney’s diapers from our bag and gave them to her. I’ve encountered so many amazing non-profits while working in the Hudson Valley. It’s a tough pill to swallow that people are living on the streets. It’s not something we see every day up here.Most people I know in the Hudson Valley are super heroes who want to help everyone. We know our neighbors. We work for non-profits, volunteer in our communities and care for each other. It creates a feeling of hopelessness to be surrounded by so much wealth and poverty at the same time. It makes me want to go back with care packages for as many people as we can carry. 5. The Commute – We drove down to Tarrytown and took the train from there into Grand Central Station. It took just a little over two hours, which isn’t bad considering I live up here in Sullivan County and we drive 45 minutes just to go to the mall in Middletown. I can understand how people in Orange, Westchester and Rockland Counties commute regularly to the city. I don’t think I’d want to do it every day, but it definitely wasn’t bad. New York City is truly spectacular. There are so many museums, restaurants, shops and sights to see. People travel from all over the world to visit. Everywhere we went there were tons of people snapping photos. This country girl did have a good chuckle when I saw people taking pictures of squirrels in Central Park. I wondered what they’d do at the sight of our wild life, say wild turkeys just randomly crossing the road or a bear that tips over your garbage at least twice a year or deer who nonchalantly walk through your yard like they own the place. We are indeed lucky to live in the Hudson Valley because we have so many amazing things and people here, but we can also easily hop on a train and visit one of the most intriguing cities in the world. We can have the best of both worlds and not everyone can say that. Erin Johnson a.k.a. The No Drama Mama is the author of “So, You’re Broke? 18 Drama-Free Steps To A Richer Life.” She can be found writing for The No Drama Mama and Hudson Valley Parent when she’s not busy caring for her three adorable kiddos. Her work can also be found on The Huffington Post, Money Saving Mom, Mamapedia and Worshipful Living. When I was a kid New Year’s Eve was so exciting! My parents would let us stay up until Midnight to take us out to breakfast. We called it “First Breakfast” because it was literally the first breakfast of the New Year. One year we went to the diner with my parents and their friends, another year the local firehouse hosted a first breakfast event. I was just four years old when my parents started this tradition, but I still remember it today! I knew I would make this a tradition for my little family one day. The only problem is, at age 6 my kids still “can’t hang.” If they do not go to bed at the same hour every night we have horrible, monstrous humans we can’t face the public with. So our solution is to celebrate a big first breakfast at our kitchen table every year. We make it special with colorful decorations and drink out of fancy glasses. It has become such a big hit at our house that I now keep a kit ready. I pull it out on New Year’s Eve after they fall asleep and set it up before I go to bed (hours before midnight). The traditional colors for New Year celebrations are silver and gold, or black and white. However, we prefer the colors of Mardi Gras- green, gold and purple. These are all colors of royalty and represent prosperity and good fortune; all great things to hope for in the New Year and they make a pretty colorful back drop to our first breakfast. Champagne Flutes– We don’t actually serve champagne (to the children) for breakfast, but we do like feeling fancy. So we serve up their morning OJ (and our mimosas) in these colorful, reusable flutes. The kids really get a kick out of it! Hats, Noise Makers and Beaded Necklaces – every year I set the table with these fun accessories for each person in the family. As soon as the kids come out in the morning we put on our fashions and march in a noisy parade through the house. Since mommy and daddy can no longer hang till midnight either, this noise isn’t so horrible after a full night’s sleep. Holiday Crackers- these are just fun! You pop them open and there is usually a paper crown inside along with some jokes and a little trinket. It keeps the kids busy while I am cooking up breakfast. They take turns cracking each other up and I get to enjoy hearing them laugh instead of argue for a minute. P.s. Holiday crackers usually go on sale for half price after the holiday season. Tableware- I use disposable decorative paper plates with matching napkins. After cooking a big breakfast of omelets, bacon and fresh cinnamon buns, and drinking a few mimosas, I could use the break from washing dishes. P.p.s I hit up the dollar stores after the holiday and pick up festive prints for 50 cents each. I stock up to keep on hand for the next few years. Masks- one of my kids wanted to start wearing masks for our parade one year and so the tradition has stuck around. We don’t wear them while eating breakfast because that would just be weird. Unless you are six then it’s just breakfast time. (I don’t even ask anymore). Clock– another kid created tradition. It makes a great centerpiece for our table. Not included in the kit are colorful foiled chocolate coins I toss around the table to represent money and sweetness. I buy these every year because obviously chocolate is not going to survive more than a day in my house. And it could get pretty gross in storage for a year. I keep all our decorations in a reusable clear tote and put away until our next first breakfast. Our version of First Breakfast may not have the same kind of thrill as when I was as a kid, but it is our own. Right now while the kids are still little and so dependent on routine, we are happy keeping the first breakfast tradition alive eight hours after the official start to the new year. It feels more manageable and sane for us. Maybe one day my children won’t turn into gremlins and we can move this tradition to a new location. Or, maybe we’ll return to this cozy tradition year after year. Either way I just hope they remember these first breakfasts as fondly as I remember mine. What New Year traditions do you and your family celebrate? When I was growing up we didn’t have a lot of traditions. We actually mixed things up year to year. There are a few traditions I keep up with my own children, and we introduce a new one here and there. But one tradition that remains the same year after year is our tradition of charitable giving. I began our first charitable efforts at my twins’ second birthday party. I asked friends to donate one non-perishable food item. As we were collecting items I told the girls where our donations will go. They probably did not fully understand. But they did help me make our final donations. Charity starts at home and making it an activity during the holiday season helps lay a strong foundation of generosity for my children to build upon. This year we continue our efforts to send Christmas cards to local kids staying in the hospital and writing letters to soldiers stationed overseas. It isn’t always money that has the greatest impact; sometimes it’s just a thoughtful act that sparks a feeling of being remembered. Every human being wants to feel like they matter. Leave cookies for your neighbors. Clean out your closet and donate gently used clothing, books and toys. Donate gently used household goods like dishes, linens and appliances to families in need. Bring homemade cards and baked goods to your local fire house, or police station. Have an ornament making party with friends and deliver to a local nursing home. Shake hands with your mail carrier. Greet your garbage collector with a hot cup of cocoa. Hold the door open for an elderly shopper. Let someone take your parking spot on a busy day. Help your child write a personal letter to their teacher thanking them for their hard work. We often think we need to buy gifts to show our appreciation, or show someone we care; when really it is the little things that add up to bigger moments. Someone may be having a bad day when they cut the line in front of you, or they may feel like no one appreciates their job collecting refuse. Offering kindness at Christmas and all year is the perfect gift! If your children are older and want to help in bigger ways perhaps helping them earn money, or make a donation will fill their desire to give back. I shared this list with you last year, but I have found five more local charities to share this year! HUDSON VALLEY HERO PROJECT- A local non-profit providing aid and caring support to veteran’s right here in the Hudson Valley. CHRISTMAS WISHES ULSTER COUNTY– A local non-profit bringing gifts to families in need in Ulster County. Accepting monetary donations through the year, and toy donations in November. GRANTING WISHES FOR CANCER KIDS ON CHRISTMAS – adopts families with children going through cancer treatment. Families paying health care coverage, premiums and co-pays for children with cancer often struggle at Christmas. ANGELS OF LIGHT HUDSON VALLEY– A local non-profit whose mission is to provide Holiday Giving for Children and Families with life threatening illness in the Hudson Valley, NY. HABITAT FOR HUMANITY RESTORE– located in Ulster and Dutchess counties. The mission is to provide stable home ownership for members of our own community. You can donate $20 to purchase a board that will be used in building a Habitat home; or you can shop at one of their Restore locations. These thrift shops include appliances, furniture, home goods and décor at the fraction of retail prices. Recycling these quality goods into your gift giving saves you money and the planet, and proceeds are cycled back to your neighbors in need. You don’t have to give big to give back. You can do small, age appropriate acts of kindness, or charitable projects with your children. If we all do one small thing for our community this Christmas it will have a big impact on our neighbors through out the year. Share some inspiration: what family traditions do you have that make it feel more like Christmas? We’re an Elf family. Our little sprites (Johnifer and Glinda) come to visit us sometime after Thanksgiving, and stay until Christmas Eve. Even though they add one more task to an already busy season, I believe it’s worth it. The innocent excitement that comes along with the daily hunt for the elves is a tradition that will be gone too soon, and one I’ll cherish forever. We do elves a little differently in our house. They don’t serve as, “Better behave, the elves are watching,” because that just doesn’t feel right for us. Our elves are visitors. They spend each day with us to bring some holiday cheer and excitement, not to tattle on bad behavior. My girls prepare snacks for the elves, leaving tidbits nearby and checking hopefully for signs of missing bites. They write notes of love and appreciation, which I secretly save for them to read when they’re older. My little one makes clothes for the elves, using scraps of fabric, ribbons, and construction paper, and delights in seeing the elves enjoy her creations. The elves are part of a daily hide-and-go-seek game (how did they get on the ceiling fan?) but they also encourage goodness. Every few days, the elves bring a note suggesting a selfless task for a friend in need, or a brownie mix to make for a neighbor, or encouragement to donate toys and clothes to someone who has less. I admit, I’m somewhat of a Grinch. I don’t look forward to the holiday season, or enjoy the disruption in routine, pressure to shop and spend, and letdown that follows on January 1st. Yet somehow, the arrival of our two little elves kick-starts my excitement every year. Something magical happens as my husband and I plan the next hiding spot, bit of mischief, or random act of kindness the elves will inspire. They’ve even become a part of our Christmas Eve tradition. We order Chinese food, watch “Elf” with the elves, and the girls give the elves a goodbye hug before bed. If your home has an adopted elf or two, you understand the bittersweet goodbye each year, as well as the relief that you won’t forget to hide the elf until next December. Share your stories, memories, and ideas with our readers, below. Happy December! Back in the day when I was just an auntie and had no children of my own, Thanksgiving seemed like such a warm and carefree holiday. I loved getting up early to get our feast started. I’d peel, boil and bake my way through hours of the early morning. I’d pass the time waiting for dinner with my nieces and nephews crafting, or head outside for a scavenger hunt. Our dinner arrived at the perfect temperature and in a fluid succession of flavors. I remember one Thanksgiving when I was about five, my mom helped us craft a Native American headdress from construction paper, and no joke made EACH of us a vest out of a paper grocery bag WITH FRINGE. My mom made fringe out of a paper bag for 4 kids (man I wish I had a picture of that!). I think we’ll go a tad simpler this year. These do not need to be fancy. Using a simple index card folded in half, or a colorful piece of construction paper works too. If your child can write, or is learning to write, make a list of names for them to copy onto each card. They can check off the names as they go and place the cards at each place setting. For little ones who cannot write, making thumb print turkeys can be fun! You, or another adult, will have to work with your kiddo to dip one thumb in some paint and place it on a card. This does not have to be perfect, or even resemble a turkey. It just has to be fun and out of the kitchen area. We love making paper chains, and I bet you have all the supplies you already need. Use whatever paper you have on hand, colorful construction paper, plain white printer paper, it doesn’t matter. Cut the paper into strips and have each kid write something they are thankful for. Start the chain by bending the strip into a circle and stapling, or taping the ends to close up the loop. Repeat until you have made a chain. Your kids will feel proud when you hang it up near the dinner table. I love to put out a fancy table cloth for special meals. It just feels a little more special. But kids are messy and it can be stressful watching your nice things get destroyed. So we roll out brown packaging paper and let the kids create their own table “cloth.” They trace their hands and color in to look like turkeys, practice letter writing with holiday messages and drawing whatever comes to mind. Now if they spill I’m not so annoyed. The paper gets tossed in the recycling bin and there’s no mess for me! Again, using whatever you have on hand works. Raid your pantry for small paper plates, or reuse paper shopping bags. Have kids cut out feathers to glue to the back of the bag, draw a face and now you have instant puppets. If you read this post before dinner starts, there is no shame in buying a ready to use kit with all the supplies inside. Get out to the dollar store or Target and pick up those play packets with stickers, a coloring book and some crayons. I set hubby and the kids up with the supplies, show them how to get started and I quietly float away to finish off the green beans. Whether you are hosting, or traveling to visit the in-laws your kids will enjoy getting to help make decorations for the feast. Having a little quiet time to think is one more reason to give thanks. Happy Thanksgiving everyone!! You may also enjoy reading Friday Favorites- Kid’s Mini Travel Activity Pouch before you travel this holiday season. I love the idea of doing holiday portraits, but the thought alone sends me into an anxiety-ridden tailspin. I have to get three kids dressed in holiday attire, do their hair, and get them to the portrait studio on time. Then I pray we get a photographer who takes their time and makes sure we have several shots to choose from. This means photos without blinking, super cheesy grins (my son Jayden’s favorite smile) or too much head tilt (Hannah and I are notorious head-tilters). If you want to create some rocking holiday cards this year, you can save some money and stress by doing it yourself. Here are 5 easy steps. 1. Set The Stage – Create your own portrait studio by setting up a backdrop. My friend Allison draped a simple white sheet from her back sliding glass door and put three small stools underneath the bottom half. Presto, instant studio. You can even get out your holiday decorations and throw some props in the shot or have your kids hold a wrapped present. My friend and neighbor Allison was the photographer for our holiday photo shoot. I returned the favor for her family. 2. 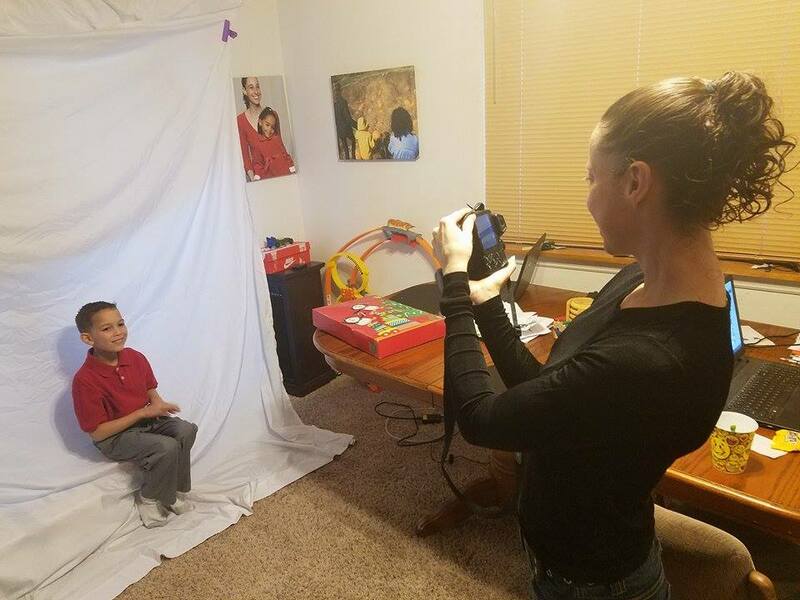 Get A Photographer – If you just want your kids in the shot, you can take your own holiday portrait, but if you want the whole family have a friend or family member come over to help you. You just need a steady hand, a decent digital camera and the patience to take a lot of shots. You want plenty to choose from.Get creative and experiment with different camera angles and position family members in different ways to get a variety of shots. Be sure to take some funny shots in between to both lighten the mood and get it out of your kids systems so they can focus on nice smiles for the other pictures.My friend Allison photographed my family and I did hers. It worked out great. 3. Do Some Basic Photo Editing – Free photo editing websites like picmonkey make it super easy to do basic editing like resizing, cropping and even red eye reduction. If you’re feeling creative, you can play around with different features like adding text, overlays and fun holiday inspired themes. 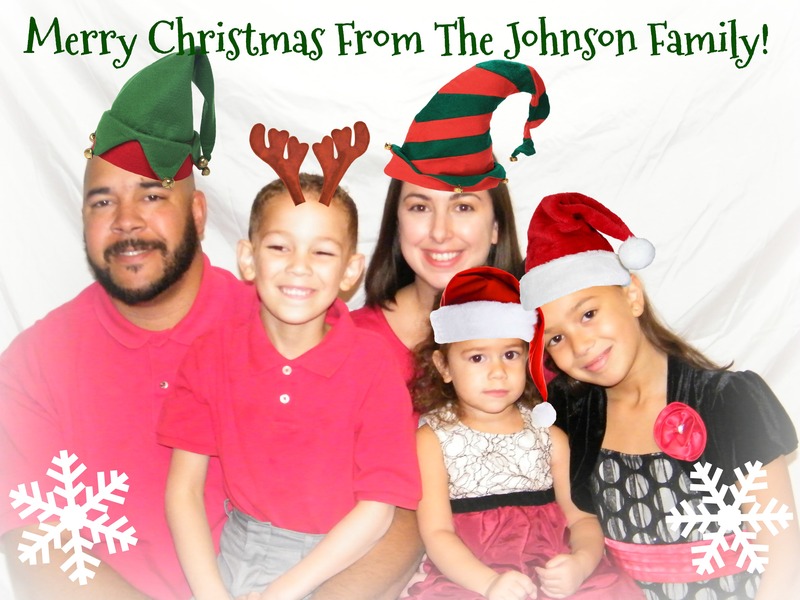 I played around with some of the features on picmonkey and created a whimsical card for my family. 4. Pick A Card – If you want to do less photo editing, you can just pick a ready-made design on sites like Shutterfly or Walmart.com and add your photo to it. Then pick your size, quantity and pay. No muss, no fuss. 5. 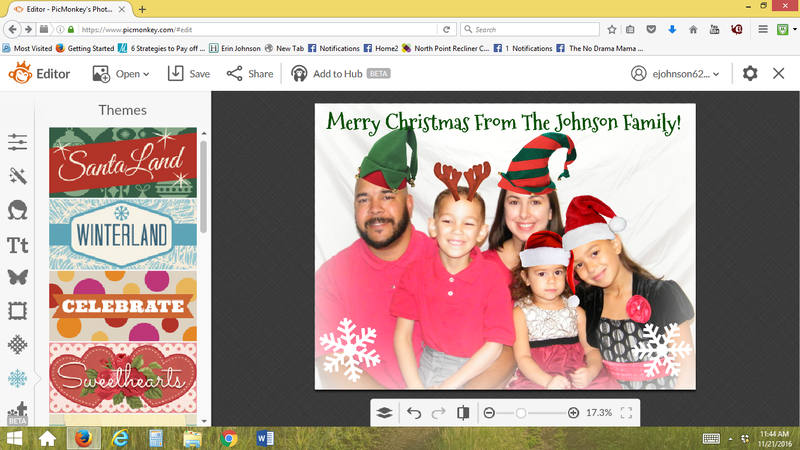 Print It – If you design the holiday card yourself, you can simply print them at home on nice photo paper. The other option is to upload it to your favorite retailer that does photo printing like Walmart, Target or Walgreens.If your best friend is a photographer a DIY holiday card is a no-brainer, but honestly anyone can take a good photo.Remember the cardinal rule of portrait photography – aim for faces, not spaces. So zoom in when you can, but don’t worry if there’s still a lot of white space. You can always crop it. My favorite part of creating my own holiday card this year was that it’s practically free except for the cost of printing and mailing the cards. It also was so much less stressful than heading to a portrait studio. We literally waited for my toddler to get up from her afternoon nap, got everyone dressed and drove two seconds to my neighbor’s house. It was fun because everyone was relaxed and we got to create memories with our friends. We even did some fun group shots at the end. So rock your holiday card this year. You got this! Last week I shared with you 8 No Crap Christmas Gift Ideas that will leave you with very little to take care of after the wrapping hits the floor. Actually, I leaked that post one week earlier than planned. I was leaving for vacation and technology was not my friend when I tried to schedule my post to arrive while I was away. Whoops! Oh well, you know how I roll without perfection these days. This week I want to introduce you to a really fantastic local charity that is helping families all over Ulster County receive their Christmas wishes. This non-profit organization was created in 2014 by Melissa Banks who was looking for a simple way to pay it forward. Melissa had just come through some difficulties as a single mom and had just finished up her degree. She really wanted to share her gratitude by helping someone else. Melissa posted a request for families looking for help in a local moms Facebook group. The response she received was phenomenal since she was only expecting one or two names. As the list grew she began asking for help making these Christmas wishes come true. Before she knew it Christmas Wishes Ulster County was created. Melissa doesn’t receive any direct funding for gift purchases, or supplies. She relies solely on the generous support of volunteers; all funds raised goes directly to serving local families. What began as a do-good deed for around 70 families has grown to serve over 600 families in 2016. It takes a lot of donations and volunteers to help sort and wrap the donated gifts. It also takes a lot of time to vet and cross check each application with other local agencies offering holiday help. This year Melissa and her team are moving to a larger location to accommodate the amount of gifts, approximately 3-4 per child, needed to help so many families. Melissa also shares how much her son is learning and growing by participating in her altruistic venture. If you would like to help contribute to Melissa’s vision of making Christmas wishes come true, or bring your young child to volunteer, please contact her at christmaswishesuc@gmail, 845-853-0496 or like the Christmas Wishes Ulster County page on Facebook for updates and details. All toy donations must be in by December 5th to allow for enough time to disperse the gifts to families on December 10th. Any financial contributions made will receive a letter for tax deduction. If you are looking for additional local organizations to donate to this year please find my Hudson Valley Charitable Giving Guide. You can print it out to make your charitable planning even easier. When we become grownups, we sometimes forgot what really makes the holidays a magical time of year. We think we can purchase it at the store. We try so hard to either give our kids the kind of childhood we had or one that is better. If we really think back, childhood itself is what’s magical. It’s the time in our lives where parents still live on pedestals, special meals have more to do with who we’re sitting next to than what’s being served, and we see the beauty in the small things like the twinkling of lights or the magnificent height of a pine tree. Here are 17 ways to make your child’s holiday magical without spending a lot of money. Take them to a tree lighting ceremony in your community. Decorate your tree together if you have one. Take a trip to New York City at Christmas time if you can. Between the ginormous decorated tree at Rockefeller Center, ice skating and incredible light and window displays, this time of year NYC is a magical place to visit. Read books to them that teach them the stories of your religious connection to the holidays. Bake cookies and make baskets/plates to give to friends and neighbors. Sing songs that get you in the mood for the holidays. It’s okay if it’s loud, silly and completely off key. Share a special meal with friends and family. The longer it’s been since you’ve seen them, the more magical it will be. My kids are excited to see their cousins since it’s been a few months since we’ve seen them last. Build snow castles. I still remember the igloo style castle my Dad and I made together twenty-odd years ago. Have a day where you gather all your craft supplies and go crazy making decorations for the house. It really doesn’t matter if they aren’t “Martha Stewart worthy.” It’s more about the process; the messier the better. Just throw down some newspaper and have fun. Take a tour of the best light displays in the Hudson Valley. You don’t need to go to elaborate displays that cost money if you don’t want to. Simply pile in the car in your pajamas with some hot cocoa in travel mugs and try to find the best lights in your area. Go sledding and/or snow tubing with your kids. Find a decent hill in your neighborhood or at a local park and spend the day riding down with your kids. We always have a blast with our kids. Have hot cocoa on a cold winter day. Add special toppings like marshmallows, whipped cream, mints or add a candy cane stirrer. It’s extra special after a day of playing in the snow. Make snow art. A few years ago I gave my kids squirt bottles filled with water and food coloring. Make a few different colors and put them in different types of containers like an empty spray bottle, a watering can, or a soda bottle with a hole drilled in the cap. Anything that could be used to make art on the beautiful white canvas will fuel their imaginations. Play Name That Tune – Holiday Edition by making loud kisses on your kid’s cheeks to the tune of your favorite holiday song and have them guess what song it is. Then they could take a turn by doing the same to your cheek. Bundle up and take a winter hike. View the majesty of local trails in a breathtaking winter landscape. Pick a charity project together. Head to the toy store and have your child help you pick out a toy for a child in need. Then donate it to your favorite charity/toy drive. My kids had fun filling boxes with small toys and toiletries for Operation Christmas Child a few years ago. It helps to have them pick out toys for children their ages. It could be any charity project that interests you. The point is to focus their heart on giving rather than just receiving this holiday season. Visit Santa – If you are at all inclined to make Santa a part of your holiday traditions, then this is a magical no-brainer. A jolly old man who delivers toys to all the girls and boys by flying his sleigh driven by flying reindeer around the world in a single night. Yes, Santa pretty much epitomizes magic. You can take photos with Santa for free at Adams Fairacre Farms. Kids don’t need you to spend a fortune on them to have a magical holiday. My dad used to say that he’d buy me a toy and I’d play with the box. Kids simply need you to get involved and use your imagination. They supply the magic. What are your favorite free holiday activities? 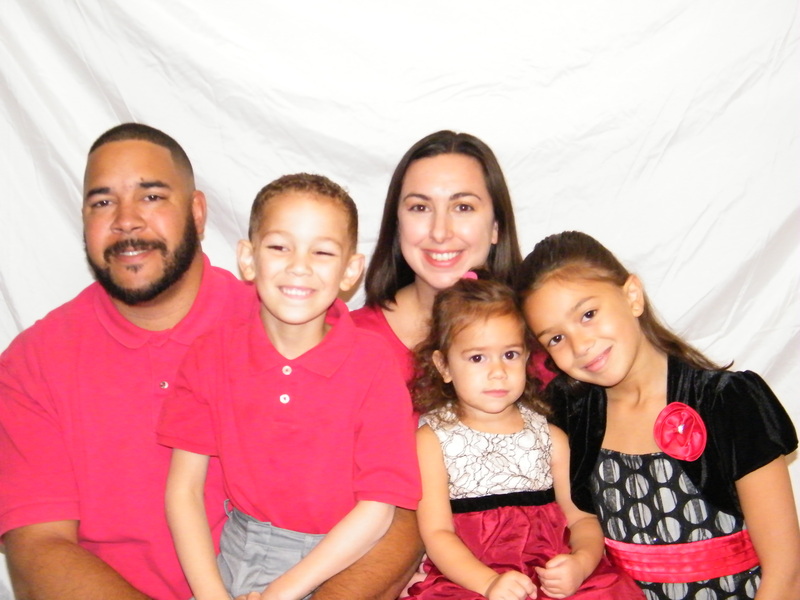 This blog is where we comment on the issues and topics Hudson Valley parents deal with every day. We invite you to join us! Please leave us your comments.